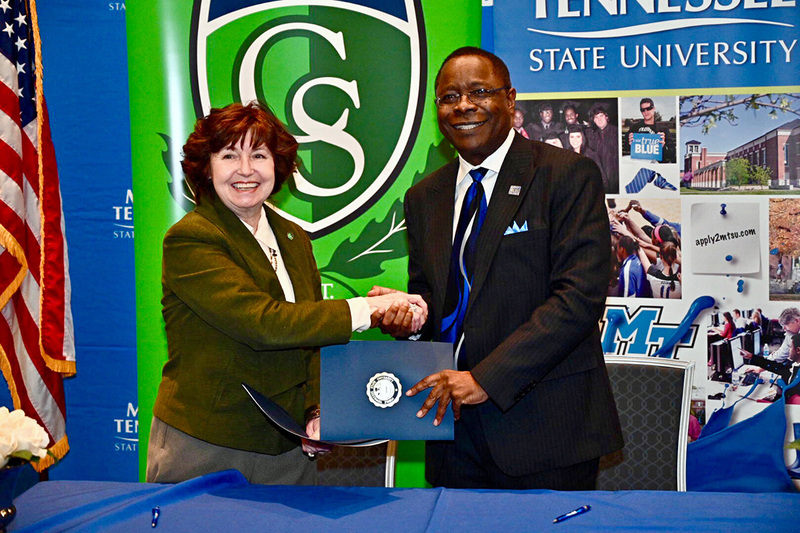 MTSU piano professor’s Feb. 15..
Middle Tennessee State University signed an agreement Wednesday, Feb. 6, to extend the MTSU Promise to Columbia State Community College, the fifth such pathway established for students with associate degrees to move seamlessly to the four-year university. The signing comes nine days from MTSU’s Feb. 15 deadline for the transfer guaranteed scholarship— $3,000 per year for those who meet qualifications. Columbia State, whose main campus is in Columbia, Tennessee, and has five satellite campuses and an online e-Campus, is the fifth community college to join the MTSU Promise program. In it, the university pledges to help students at partner schools complete their associate degrees, then move forward in seeking a four-year degree. McPhee signed agreements last year with Motlow State, Cleveland State, Southwest Tennessee and Dyersburg State community colleges. MTSU staff and recruiters are currently visiting colleges as part of the “MTSU Promise Tour” to recruit prospective transfer students. Smith said she looks forward to renewing the partnership with MTSU. “The majority of our students transfer to MTSU, and our faculty look forward to coming to MTSU and discussing curriculum with their faculty,” Smith added. 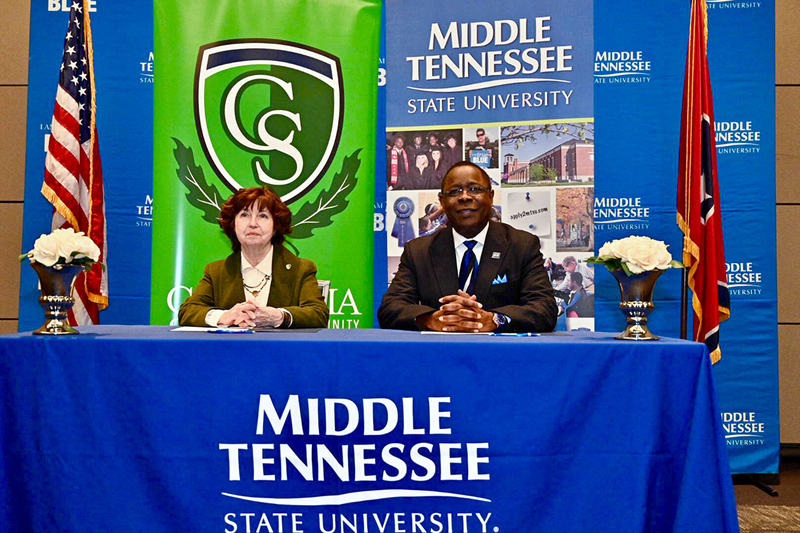 The agreement calls for Columbia State to share its students’ directory information with MTSU so they’re included in tailored emails and hard-copy mailings to support planning for a bachelor’s degree after they successfully complete an associate degree. The pact also says Columbia State students who agree to participate in the MTSU Promise will sign a “reverse transfer” agreement. If they fail to complete their associate degrees before they transfer to MTSU, they’ll automatically receive their associate degrees from Columbia State once they’ve completed sufficient credits at MTSU. Through its existing Guaranteed Transfer Scholarship Program, MTSU will provide Columbia State students who transfer to MTSU with $3,000 per year for two years, or a maximum of four semesters, based on their achieving a 3.0 GPA. Dr. Deb Sells, MTSU’s vice president for student affairs and vice provost for enrollment and academic services, said the MTSU Promise is a program where Columbia State and other community college students can begin to consider their bachelor’s degree as they begin their associate degree. Sells said the annual application deadline is Feb. 15, which means the majority of participating Columbia State students will have completed 60 credits before they transfer. MTSU will also guarantee that if these students complete 60 credits with a 3.0 GPA at Columbia State, they will be guaranteed admission and a scholarship to attend MTSU for their last two years of study, Sells said. Smith told the group that her nephew, Mat Smith, is a senior computer science major at MTSU. The Dickson, Tennessee, native transferred from Columbia State, where he earned a general transfer associate of science degree. 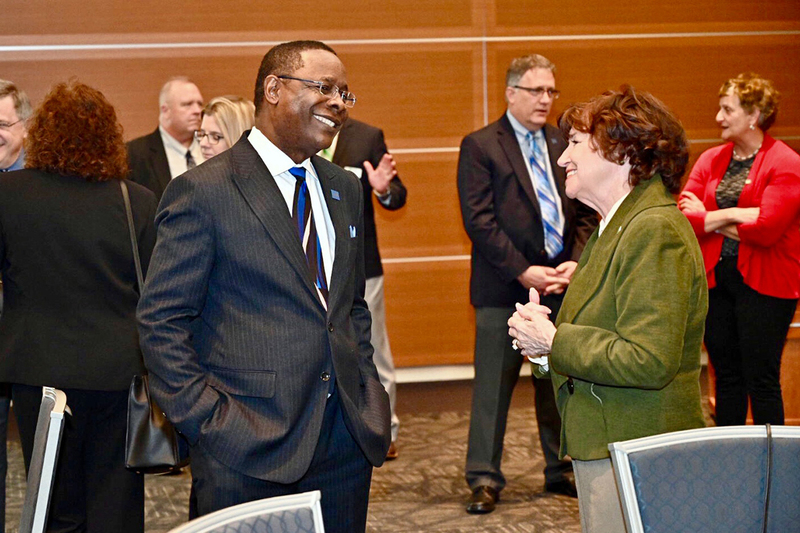 Smith was joined by several key Columbia State administrators, including Dearl Lampley, vice president of the Williamson Campus and external service; Sissy Holt, VP of student affairs; and Mary Lou D’Allegro, VP of academic affairs. Columbia State’s other campuses are in Franklin, Lawrenceburg, Lewisburg, Clifton and Spring Hill. To learn more, visit https://new.columbiastate.edu.